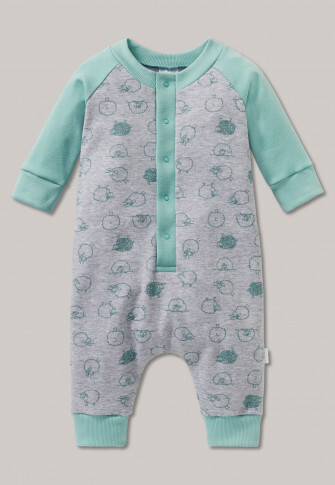 These long unisex baby pajamas are just the thing for cozy days and nights! Super sweet, mint-colored lambs frolic on the heather gray background, accompanied by sleeve and leg cuffs in the same color. The wide snap placket in mint ensures easy changing, and thanks to 100% soft cotton these retro pajamas are wonderfully comfortable. A favorite for little princesses and little ruffians!